Onkyo reveals budget AV receivers for 2015 | What Hi-Fi? Onkyo has announced two new entry-level AV receivers, the TX-SR343 (£249) and TX-NR545 (£449), both of which go on sale in May. They are the first products from the new Onkyo and Pioneer AV collaboration. The 5.1-channel TX-SR343 (£249, pictured below) is the first rung on Onkyo's home cinema ladder. To reflect its standing, the company claims to have given the amp a simpler design, including a completely revamped rear panel with clearer labelling and illustrations. There's also built-in Bluetooth for wireless music streaming as well as DTS-HD Master Audio and Dolby TrueHD decoding. But all eyes (and ears) will be on the forthcoming 7.2-channel TX-NR545 (pictured above), which looks set to go head-to-head with the recently announced Sony STR-DN1060 and Pioneer VSX-930. The TX-NR545 is the most affordable receiver in Onkyo's range to support Dolby Atmos, and also features Wi-Fi, AirPlay, Bluetooth and Spotify Connnect functionality. You can control the receiver using the supplied remote or via Onkyo's Remote 3 app. The 'NR545 features high-resolution audio support and will be able to handle not only 24-bit/192kHz content but also DSD files. Elsewhere, Onkyo's AccuEQ system is on board to handle all the necessary speaker calibration. On the video front, the TX-NR545 supports 4K video at 60Hz. Its HDMI sockets are also HDCP 2.2 enabled, meaning they'll be ready to support the 4K Blu-ray disc format as and when it arrives later this year, and there's a USB input on the back. 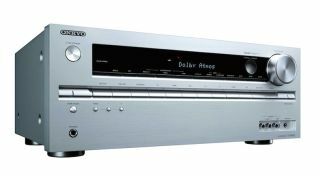 The amplifiers are the first fruits of the collaboration between Onkyo and Pioneer, following Onkyo's acquisition of Pioneer's AV division earlier in the year.